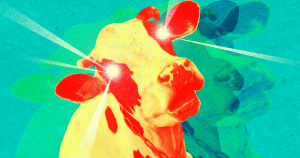 To test their system, the researchers shot low-powered lasers into the cows' eyes. In an effort to protect ourselves from our own idiocy (no, “password123!” is not going to thwart any hackers), our devices and platforms are relying on biometric readings — fingerprints, facial recognition, iris scans — to keep our information secure. Even our bank cards will likely have built-in fingerprint scanners. But even biometric security systems have their own shortcomings. Fingerprints can be replicated, iris scans have to be stored on a database somewhere, and facial recognition can be spoofed without too much effort. Now, a team of researchers at the Organic Semiconductor Center at the University of St. Andrews in Scotland are trying to make biometric security safer, by producing tiny stickers that reflect light of a specific wavelength, according to a paper published Tuesday in Nature Communications and covered by IEEE Spectrum. These lasers could make conventional biometric scanners even safer by reading these reflected wavelengths, on top of conventional metrics, like fingerprints, and iris patterns. Here’s how it would work. A scanner would emit light, directed towards a sticker stuck on anything you’d want to protect — security cards, contact lenses, finger tips. The sticker is made of layers of organic, semiconducting polymers with nanoscale grid of grooves etched on top, which reflects light in just such a way so that it only produces specific wavelengths — the “key,” the equivalent of a password. Each sticker is different because it has different grooves, which emit different wavelengths. Lasers embedded in the scanners then read the wavelength of light, granting access if the sticker credentials are right. To test their system, the researchers stuck a sticker to a contact lens that was applied to a cow’s eyeball. They shone a light at it, and observed a “well-defined green laser beam emerging from the eye” — exactly what they were looking for. And there’s more good news: the light they shined was low-powered enough to be directed at the eye without damaging it, meaning that the technology could be used in contact lenses for humans. The researchers are hoping that these stickers could act as a kind of “light barcode,” adding an extra security layer to conventional biometric security methods. For instance, an iris scanner could be outfitted with a low-power laser beam that could read these wavelengths — on top of the conventional near-infrared scans of the iris. The researchers suggest that these kinds of systems could make counterfeiting banknotes a lot harder, or provide an extra layer of security for fingerprint scanners. No security system is flawless. It’s a perpetual cat-and-mouse game: security firms develop new technologies, only to have rogue agents find ways around those measures. Biometric security is no exception. The more biometric data we store, the more vulnerable we are, so every additional layer of security will help keeping our data safe.